Indian restaurant lamb curry. Big flavours. And that lush gravy you get when you go our for Indian food. This is how they do it. This Indian restaurant lamb curry is nameless. There’s no long standing traditional dish behind it. It’s a bit of an accident really but a really tasty one. I set out to make a particular curry one night. Didn’t have the ingredients I thought I had so I had to improvise. And I came up with this lamb curry. Since then it’s become one of my house curries. Regular fixture in my kitchen. I guess it has a name. It’s the glebe kitchen house curry. I used lamb here but it works really well with chicken. Beef works too. That’s the thing about this style of cooking. You can mix things up and it will still be good. But lamb is my favourite. So it’s a lamb curry. This is my house Indian restaurant lamb curry. 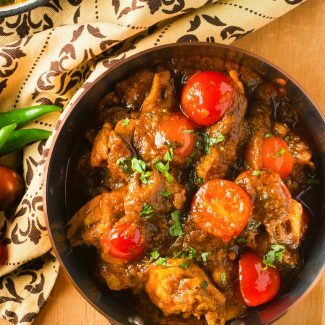 It’s a good starting point to make your own house curry. Something you don’t like? Leave it out. Want it a bit zingy? Add some lemon or tamarind. Like it sweet? Add some extra sugar. Hotter? Bring it on. Have fun cooking. That’s the important thing. Do your prep before you get started. Make your curry base and have some heated and ready to go. Pre-cook your meat. Measure out your ingredients. Have everything ready. Put on some old clothes – a bit of splatter is part of the fun. If you have not yet read the guide to Indian restaurant technique yet, do it now. It has pictures to help you understand the recipe. There’s also a guide to Indian ingredients in that post. 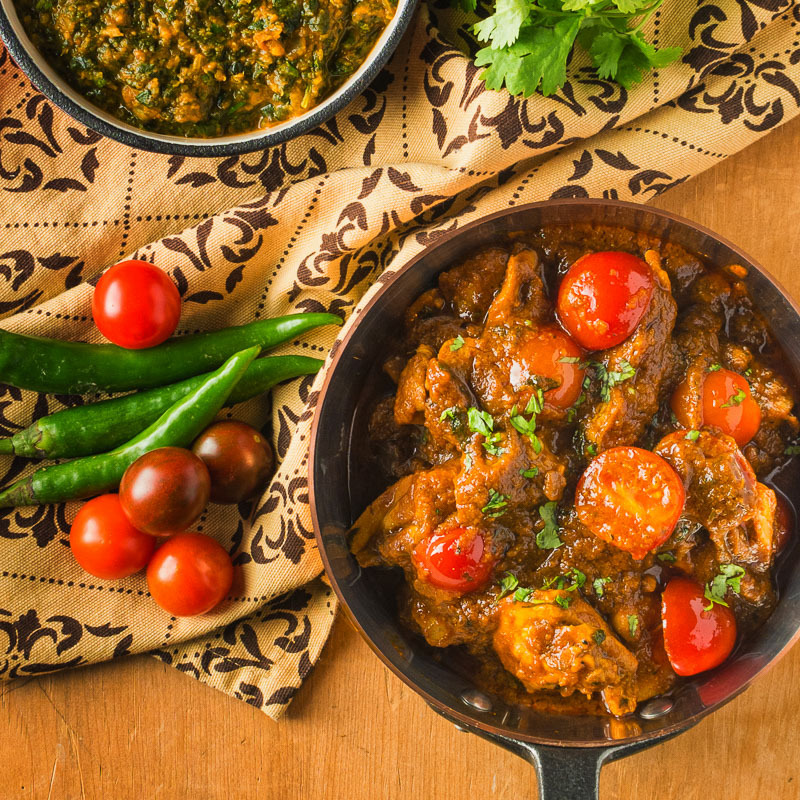 This is a house indian restaurant lamb curry recipe. It's medium hot and flavourful. It's also a great starting point if you want to start experimenting with Indian restaurant curry. When the oil starts to shimmer add the cinnamon stick, bay leaf and cardamom pods. Toss the whole spices around the pan for about 15 seconds until bubbles start to form around them. They may crackle a bit. Add the onions or shallots and chopped cilantro and stir constantly until the edges of the onions start to brown. This takes about a minute. Turn the heat up to medium high. This is important. Add the diluted tomato paste and stir until bubbles form (the oil will likely separate). This takes around 30 seconds to one minute depending on the heat. Add the rest of the curry base and let cook until the bubbles form. Turn the heat down to low and add the pre-cooked lamb, beef or chicken. In beef, indian, main course, meat, poultry. Bookmark the permalink. I never get Indian takeout anymore either. In fact, now when I go to Indian restaurants I am consistently underwhelmed. It’s a lot of prep but once it’s done you can just crank out curries all week. The second time I tried it I steamed some potatoes and added them at the same time as the beef. Definitely made it even better (love potatoes). Thanks for always posting amazing things… so excited to try the lobster bisque! I’m so glad you have taken the time to learn about Indian restaurant curry technique. Next time I make it I’m going to add some potatoes too! Hi….i tried luking for the ‘about’ section so t hat i cud find out ur name n also the meaning of the blog name…but no luck….can u please enlighten me? 😊. Thanx…. I should really get around to putting up an about me section. My name is Romain. The name glebekitchen comes from the name of my neighbourhood – my kitchen is in my neighbourhood so that’s the name of the blog. Thanks for taking the time to ask. How do you make a LAMB curry with a 10oz CHICKEN???? That’s the beauty of of Indian restaurant style cooking. You can substitute chicken or beef or shrimp. It’s a lamb curry but I include other meats in the recipe to let you know you have choice. Holy mother of god. I made this with prawns. Amazing! Awesome! Can’t wait to hear how your next one turns out. sorry if this is a stupid question but is the ’15oz of curry base’ fluid oz’s or 15oz weighed on a scale? In this case the measurement is fluid ounces. Just a bit under two cups. 237ml per cup is you use metric.